This Friday was the 2014 Spring Fashion Trunk Show at the Hilton Naples Florida Hotel, which was a benefit for The Garden of Hope & Courage located on the Downtown Naples Hospital Campus of the NCH Healthcare System. Their mission is to create a garden sanctuary, for people diagnosed with cancer, to visit a peaceful haven that would foster hope and courage for those who are fighting for their lives. Girl Talk TV is the place to go for Style, Fashion, Beauty tips, Health Products, Entertainment & Fitness information today! Founded by Sherry Bryant, it full of chic and savvy knowledge to help you live a better life. To see more videos from the event, visit the Girl Talk TV website. You’ll see more from the Designers, Boutiques, Health Spa’s and other vendors who participated in this exclusive event. 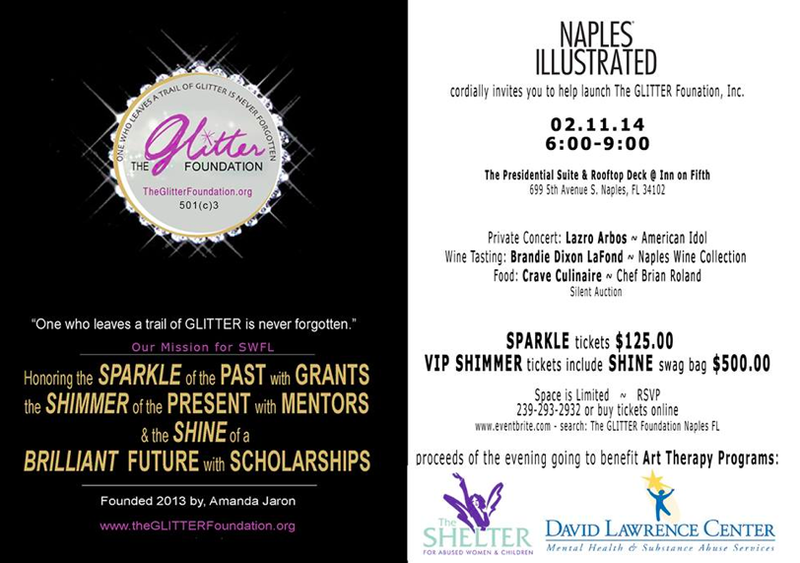 The Glitter Foundation, founded by Amanda Jaron in 2013, is dedicated to supporting students and educators through grants, mentorships and scholarships. Tonight’s launch will help fund Art Therapy programs at the David Lawrence Center & The Shelter for Abused Women and Children. This event was presented by Naples Illustrated magazine and started off with a jewelry trunk show at Port Royal Jewelers where proceeds went to the Foundation. This was followed by an evening in the Presidential Suite & Rooftop Deck at the Inn on Fifth in Naples, Florida. To support The Glitter Foundation Inc. mission, please visit their website. NEW PARTNERSHIP WITH THE GLITTER FOUNDATION, INC. The Glitter Foundation, Inc. was founded by Amanda Jaron. The foundation’s primary focus is to support applicants, both students and educators, to receive funding for higher education. Please visit the website to get more information. 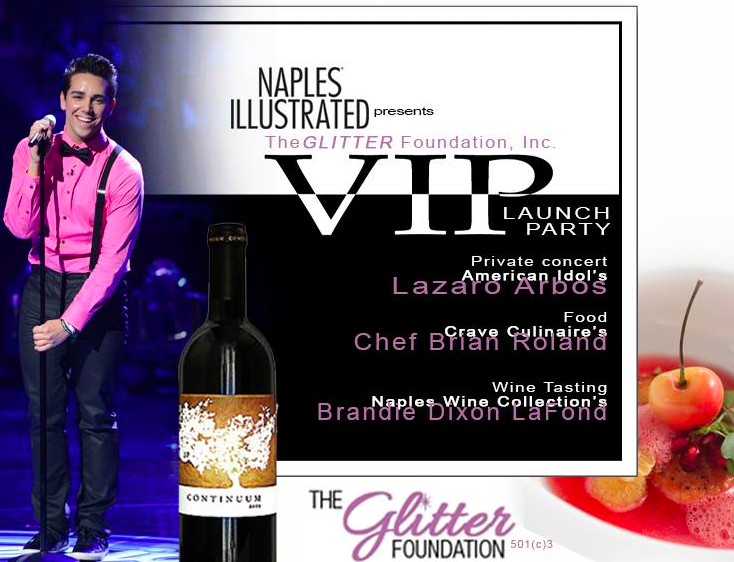 Join us Feb 11, 2014 at the Inn on Fifth for the official launch party sponsored by Naples Illustrated. Click here to attend the event! The Mona Lisa Project is a way to tell your story though jewelry and personal heirlooms. These stories are then shared with the next generation. How did you get your engagement ring? When did you get your first diamond? For a $500.00 tax deductible donation to the Glitter Foundation, we will videotape you telling your story about when and how your husband proposed or when your mother passed down that family treasure. The story is up to you! We’ll then add your video to the projects’ archive and give you a copy to keep for yourself. This inspiring archive will preserve the rich history of your heirlooms for future generations to cherish. Money raised by the Glitter Foundation will go to helping others receive funding for higher education. It’s a great cause! In addition, sign up for a full Family History Video and we will contribute 20% of the price of the production to the Glitter Foundation in your name. This video was filmed for a charity event for the American Heart Association’s Go Red For Women, Fashion Obsession, fashion show. This is a cause I really believe in. Make-A-Wish Foundation® of Southern Florida » Blog Archive » Mark Micheel. I filmed an event Hosted by Saks Fifth Ave at the Waterside shops in Naples, Florida. The 8th Annual ” If the Shoe Fits” event for The Education Foundation of Collier County. The event will benefit Take Stock in Children, the mentoring & scholarships program of The Education Foundation. I support the foundation because I think they do great things for the community. This video highlights the event and features event sponsor A. Jaron Fine Jewelry. Check their website at www.educationforcollier.org for more information. Inspired by Amanda Jaron, children create christmas ornaments for charity and discuss the mentoring program “Take Stock in Children”. A. JARON Fine Jewelry, one of the title sponsors, launched it’s 2009 collection LUSH during the event. Inspired by the energy of New York City and the beauty of Florida, designer Amanda Jaron has taken her art to a new level. See the collection for yourself at www.ajaron.com. This video was produced for Rabbi Mendy Greenberg of the Chabad of Bonita Springs & Estero. It is a meaningful mini Documentary which show’s a young 15 year old Mendy with the Rebbe Menachem M. Schneerson. I support the Chabad because they do great things in the community. The Rabbi and his family have been very warm and inviting towards me and have invited me for many dinners and fun events. There is a uniquely special place in my heart for him and his family. If you want to find out more about what services and events that the Chabad offers, click right here: Chabad of Bonita Springs & Estero.